Mary SIGLER was born about 1863 in Madison County, Indiana to parents Richard Marcus SIGLER (1824-1910) and Vandelia or Vandalia GOODING (1834-1916). Mary married Andrew J. SCOTT on 31 December 1882 in Madison County. Francis M. Sigler - born 27 July 1862 in Madison County, Indiana; died 22 July 1905 in Madison County; buried in the Sigler Cemetery in Frankton, Madison County. Shelley is hoping to locate someone from this Sigler family so that the autograph album can be returned to the care of family. If you are a descendant of this family, or you know someone who might be, please contact her directly. The Indiana Genealogical Society has added the June 2013 issue of Indiana Genealogist, the quarterly publication for our members, to the Members Only area. IGS members can login to the IGS Records section to download their copy. William Ed McCullough (born October 1863; died June 1915) married 29 August 1886 in Clay County, Indiana to Samantha E. DeCamp (born October 1866; died December 1951). Ed McCullough was a school teacher. Rachel Esther McCullough (born 27 January 1888 in Asherville, Clay County, Indiana; died July 1958) - married 9 June 1907 in Clay County to David Wilson Stein (born 11 October 1886 in Scotland; died May 1959). Charles Grandison McCullough (born 19 October 1893; died 1949; buried in Poland Chapel Cemetery, Poland, Clay County, Indiana) - married 5 October 1918 in Vigo County, Indiana to Anna May Keiser (born 17 June 1898; died 1989; buried in Poland Chapel Cemetery). Lela/Leona McCullough (born April 1900; died after 1940) - Lela was a teacher in Terre Haute. She is listed as divorced in the 1940 census. Ruth A. McCullough (born 15 August 1906 in Knightsville, Clay County; died January 1995) - married 14 June 1931 in Parke County, Indiana to Culver W. Krantz (born 4 March 1906 in Highland, Illinois; died June 2000). Ruth was a teacher in Terre Haute. If you recognize these names, or are a descendant of this family, please contact Lewis Lamson directly. Trying to find out if my great-great grandfather Isaac Watson, who was born in North Carolina in 1791, died in Sullivan or Greene County, and if so what year. He was married to a Sophia Walker. Any assistance would be appreciated. Shelley Cardiel (cardiels@comcast.net) has found this old photo identified only as "with compliments of Mr. & Mrs. E. H. KEARNS" which was taken at the Beasley Studio in Remington, Jasper County, Indiana. 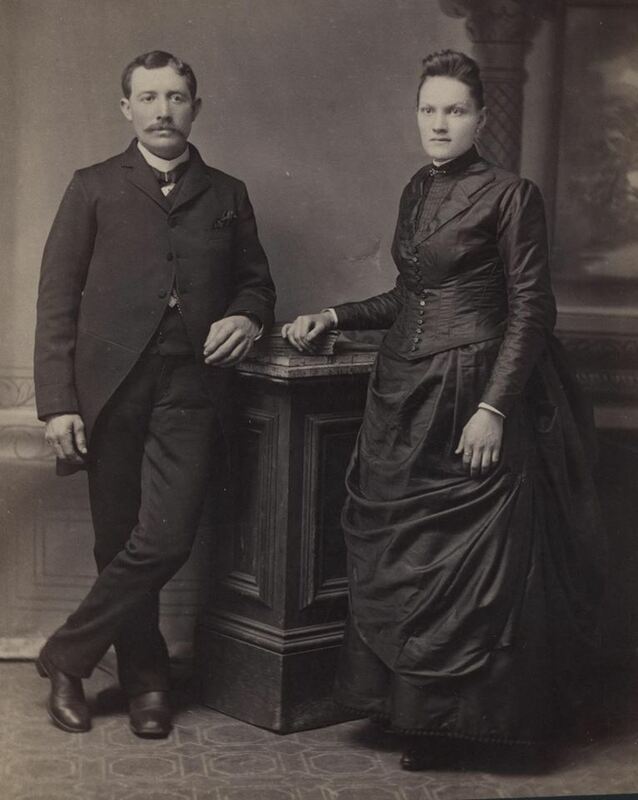 The photograph appears to have been taken in the 1880’s, with the couple likely in their 30’s at the time. There is no other identification on the photo. If you recognize anyone in this photo, or are a descendant of this family, please contact her. Do you have any information on Chief Pacanne of the Miami Indians? He was my 6th great grandfather, and I'm trying to put together a family tree. My great grandmother Adelia Soudriette married John H. Clark in Vincennes on April 1, 1877, and her mother Suzanne Bonneau is the lineage connecting me to him. Can you point me in the right direction? I'm a little new at this. I also see that Adelia Soudriette was christened Nov. 24, 1849, also in Vincennes. Is there a way to get these documents? I wish I had something on Chief Pacanne and the others! Please let me know if it's possible to obtain and how much it would be. Can you help me with anyone else? [IGS Note 2: These documents should be available from the Knox County Clerk in Vincennes. The LaPorte County, Indiana Genealogical Society will meet on Tuesday, July 9 at 7 pm. Mark Chase will present a program on the graves of Civil War veterans in northwest Indiana. He is the founder of the Calumet Region Civil War Preservation Project, which has worked to replace some 80 deteriorated headstones of Civil War veterans' graves in the Calumet Region. His research on these veterans is part of the new historical tourism trail, the South Shore Civil War Memorial Trail. NOTE: The society has a new meeting place - the La Porte City Parks and Recreation Department building at 250 Pine Lake Avenue. From downtown La Porte: follow US 35 (Pine Lake Avenue) north past second traffic signal at Weller Avenue. Just past monument area, make a left turn to the parking area. From north (Michigan City way): follow US 35 (Pine Lake Avenue) south past the Best Western and Red Carpet Liquors. Make a right turn in the drive by the flag pole in the monument area. The Johnson County Museum of History in Franklin, Indiana will hold a "Late Night in Genealogy" event on Friday, June 28 from 4 to 10 pm. The genealogy library will be open extended hours and researchers will be on hand to help. Late night snacks will be served. At 7 pm, there will be a special presentation about Kentucky land records given by Kandie Adkinson from Kentucky’s Land Office Division. She will discuss how inspecting official land documents may reveal valuable information about how your Kentucky-area ancestors lived and worked. This is a free event - to reserve a spot, please contact the museum at (317) 346-4500. Hello, I'm searching for any information on John B Smith that gives his parents names. John B Smith born 8 August 1808 NJ; Died 23 September 1901 Middle Fork, Vermilion County, IL; Married 26 October 1836, Fountain County, IN, to Susannah (Liggett) Parker. Elizabeth J. Smith Born about 1839 IN. John B. Smith was in Cain Township in the 1850 Census: then in the 1860 Census he is in Cain Township, Fountain County, IN, at age 52. In 1870 he was still in Middlefork age 62. In 1880 no census located, but in 1900 he is in the census living in Middlefork, Vermilion County, IL, as a widower, age 92. He then died at age 93. In all the census records it shows him being born in New Jersey and both his parents born New Jersey. I have his will, but it does not give his parents' names. I can't find John from his birth in 1808 until the 1850 Census, the first 42 years of his life. His wife Susan was born 31 December 1811, in Brown County, OH. Her father was William Liggett and Esther (Hays) Liggett. She died 2 August 1892, Potomac, Vermilion County, IL. The Rivers Institute Traveling Show of Hanover College will present a short play, "Nothing Stops This Train," at the Thursday, July 18 meeting of the Southern Indiana Genealogical Society. The play is a story of abolitionists John and Sarah Tibbets and a slave named Georgina who helped other slaves escape via the Underground Railroad. The play is set in Jefferson County, Indiana, home of Eleutherian College, the first college in Indiana to admit students regardless of race or gender. Meeting time is 7 pm in the Strassweg Auditorium of the New Albany-Floyd County Library, 180 W. Spring St., New Albany, Indiana. For more information about the Southern Indiana Genealogical Society, please visit http://www.rootsweb.ancestry.com/~insigs/nextmeet.htm. These profiles were compiled by Gloria Arndt and Dorothy Palmer. Shelley Cardiel (cardiels@comcast.net) has found this old photo identified only as “BAKER Family” which was taken at the Star Gallery in Fort Wayne, Indiana. 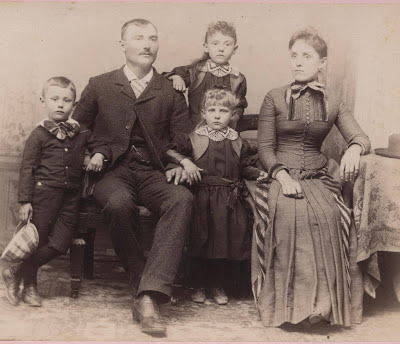 The photo appears to have been taken in the 1880’s, with the couple likely in their 20’s or 30’s and three children ranging from age 4 to 8 years old. The oldest is a girl, the middle a boy, and the youngest is a girl as well. There is no other identification on the photo. If you recognize anyone in this photo, or are a descendant of this family, please contact her. The LaPorte County, Indiana Genealogical Society has a new meeting place as of their next meeting (Tuesday, July 9 at 7 pm). They will meet at the La Porte City Parks and Recreation Department building at 250 Pine Lake Avenue. I am looking for information on John Klen Sr. He was born in 1869 in Czechoslovakia and died July 27, 1939, Whiting, Lake County, Indiana. The information that I need is the names of his parents. According to my uncle, we have Klen relatives in Indiana, but he does not remember any names, just that he was a politician. I searched many places including history and genealogy books and found nothing on him, his parents or siblings. I saw the requirements for ordering death certificates in Indiana, and I don't think I will be able to get a death certificate. Any help would be great. The Indiana Genealogical Society now has 1,080 databases in the Members Only area. Each of Indiana's 92 counties has at least 4 databases. The Federation of Genealogical Societies’ 2013 Conference is August 21-24 at the Grand Wayne Convention Center, which is just a block away from the Allen County Public Library (ACPL) in Fort Wayne, Indiana. On top of the great lectures, workshops and luncheons, this year’s conference will also feature extended research hours at The Genealogy Center. The Indiana Genealogical Society will have a strong presence at the conference. Conference speakers include IGS Vice President Tina Lyons, Past President Curt Witcher, Quarterly Editor Rachel Popma and LaPorte County Genealogist, Harold Henderson. Curt Witcher will give a talk, "The Indiana Genealogical Society: A Case Study in Thriving" at the IGS Luncheon on Friday, August 23 at 12:15 pm. IGS will also have a Society Showcase table in the Exhibit Hall. And there are several IGS people working behind the scenes planning the conference, including IGS Recording Secretary Dawne Slater-Putt, who is one of the Conference Co-Chairs. Conference details and registration are available online at https://www.fgsconference.org. The deadline for the Early Bird Discount is July 1st, 2013. Make sure to purchase your tickets early to the luncheons (especially the IGS luncheon), workshops and special events in order to guarantee your spot. If you would like a print brochure or need some for your local society or library, fill out the form at http://tinyurl.com/bjhaeok. Society Showcase - This is a great, affordable way for societies to highlight what they offer. FGS Member Societies can reserve a table in the Exhibit Hall for only $25. These tables are for promotional purposes and selling memberships and may not be used for other sales. To learn more about the Society Showcase, visit https://www.fgsconference.org/exhibits/society-showcase/. If your society would like to sell other items, there is still a booth available in the Exhibit Hall (https://www.fgsconference.org/exhibits/). Society Publicity Contest – FGS Member Societies are also eligible to win a free conference registration to the FGS 2014 conference in San Antonio, Texas if they help publicize FGS 2013 in print and online publications. You can find graphics and articles to use in society publications at https://www.fgsconference.org/media/society-publicity-contest/. In order to be entered to win, make sure you fill out the contest form and let FGS know each time your society publicizes the conference. Indiana Librarians - All of the conference sessions qualify for LEUs. Librarians’ Day is Tuesday, August 20, with sessions focused on librarians who serve genealogists. For more information, visit https://www.fgsconference.org/program/librarians-day/. August will be a great time to show off what Indiana has to offer to genealogists - we hope to see you there!